These fun Peekaboo Crocheted Flip Flop Toppers will definitely make your slippers look totally fab and ultra stylish! They will make leisurely strolls more lively and cheery! You can use these crocheted embellishments to dress up your basic flip flops and also update your old pair. In fact, this pattern is a wonderful project for experienced beginners and intermediate crocheters. 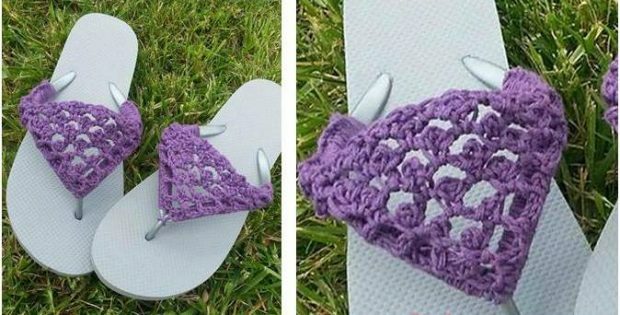 Included in the pattern is a helpful photo tutorial that will aid you in making these crocheted flip flop toppers. The photos will take you through the process of making these slipper ornaments, step by step. This awesome crochet pattern was designed by Lisa Egan (Pink Snail Boutique) for Cre8tion Crochet. In fact, you can access the FREE pattern for this crocheted creation from their website. To access the FREE pattern for this creative crocheted embellishment, please click on this link: Peekaboo Picot Flip Flops Pattern. Featured image: Pink Snail Boutique/ Cre8tion Crochet – thank you!